As you well know it is becoming increasingly difficult to find a good in-school program that is worth taking up your school’s time; until now. Nationally known Folk Artist Jack Martin and his wife Dee have developed a living history considered by many as one of the “Top Visual and Educational Program” around. Sanctioned by the Tennessee Arts Commission and the Jackson & Memphis Arts Council. Jack will bring the 1850's style broom making equipment still being used by the Hockaday Family even today; and spend the day with the students talking and making brooms from start to finish. Each show takes an estimated 55 minutes, more or less depending on the grade. 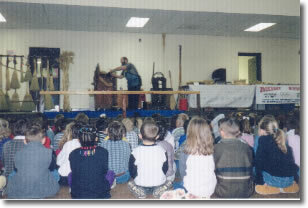 The whole show is centered on showing the students how we use all basic skills (math, history, science, etc) in our old-fashioned broom business. We can do up to 5 shows a day in your school. Set up is normally in the gym because we have a large display, and the students come in and sit on the floor in front of Jack. Most of the display items are on rolling platforms; so flat level surfaces are needed. We will be at your school about 7:00 am to set up and will be ready to go when first period starts. We will furnish you with a letter to go home to the parents, which will let them know when we will be at their child’s school. The cost of the show will vary depending on the school location. In West Tennessee the cost is $1.00 per child. Jack has demonstrated to over 700,000 students in West Tennessee schools alone. If you can’t bring the kids to the museum, then bring the museum to the kids. Now is the time to plan that field trip. Come to Hockaday Handmade Broom Musuem and step back in time 100 years; right down to the old-fashioned outdoor bathrooms. 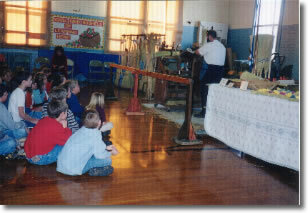 The kids will see, feel and smell the 1850's style of broom making. We show the kids how we use education in the making of our brooms, everything from math to science. The tour can range from one hour to three hours. The tour begins by seeing the modern day way of broom making and discussing the materials (broomcorn and wood) used in making brooms. The Hockaday family still grows their own broomcorn. The kids should bring their own lunch, and we will sit under the trees and discuss the days events. In our gift shop we have an area just for the kids to shop; which is all broom “stuff” ranging in price from .50¢ to $5.00. Our living history show is one of the best, so please give us a call. We are located on Highway 142 East, Selmer, Tennessee. About one hour from Jackson, Tennessee or about two hours from Memphis, Tennessee. There is a two-dollar per child fee; and the adults are free. For booking dates please call 731-645-4823; or e-mail info@hhbrooms.com. Let’s work together to keep Folk Art Alive.